team this past summer, we were excited to be able to work on making Google Docs that much more useful for students like us. We've now added a bunch of back to school features which should help our fellow students make the transition from summer to school that much easier — and we hope they'll be useful to you non-students as well! 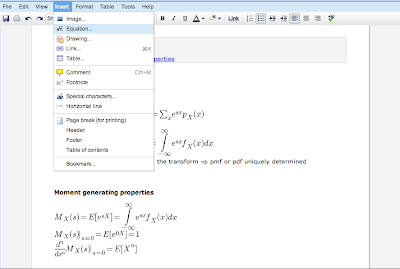 We created an equation editor so you can easily complete problem sets online or write papers that include equations. 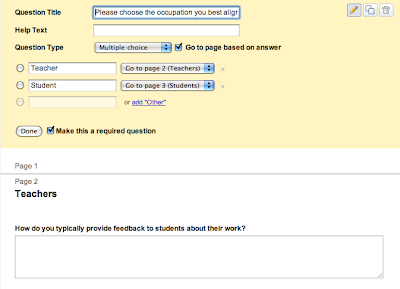 If you're taking math, you can now take notes in class or answer questions using Google Docs. For language enthusiasts, we integrated translation features into Google Docs. You can translate either a single word or an entire document — handy for making sure you're on the right track when writing those foreign language essays. For those of you conducting surveys, we added a "Go to page based on answer" option in Google forms, making it easy to show participants only those questions that are relevant to them. We also came up with a few features for humanities buffs. To make outlining term papers more customizable, we made it easy to select different bulleting styles for lists by adding an option to the format menu. And when that paper is written and ready to turn in, you now have the option to print footnotes as endnotes for a cleaner-looking paper. As interns on the Google Docs team this past summer, we were excited to be able to work on making Google Docs that much more useful for students like us. We've now added a bunch of back to school features which should help our fellow students make the transition from summer to school that much easier — and we hope they'll be useful to you non-students as well!